Manage your resources and create a huge variety of buildings. 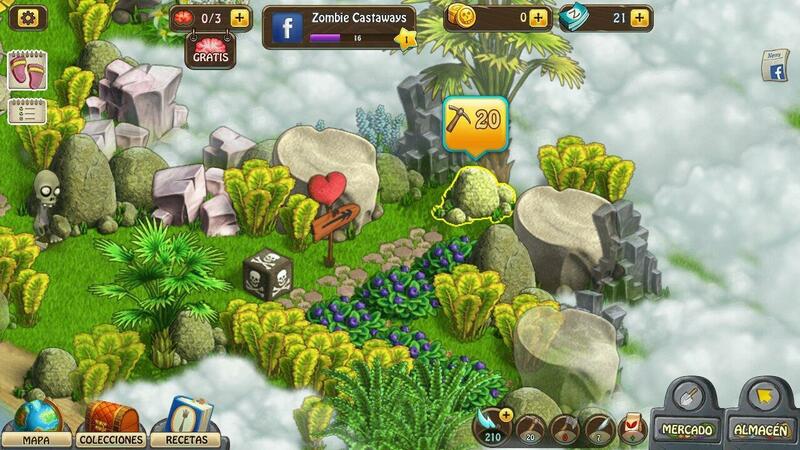 Zombie Castaways is a brilliant island building game in which you have to play a zombie looking for zombium to turn back to a human in order to reunite with his lover. Explore the island for resources and enjoy a huge variety of building categories in the game. Your goal is to explore the island by removing the trees, bushes and marble stones blocking your way. In order to manage the resources needed to complete the task, you have to build and manage your island. Start with planting seeds like blueberries, clovers, rye, poppy and more. You can also expand the island territory by using bangs in the game that explode the obstacles in the way and reveal more land for you to harvest or build upon. A huge variety of building variety is available in the game. Collect the required resources from the island and build water wells, crypts, light houses, mills, castles, universities, business centers and much more. You can also upgrade each building and can place it wherever you want on your island. If managing a huge island gets tougher for you, you also hire zombie workers to carry out necessary tasks while generating revenue. You can hire cooks, brigades that will help you in speeding up the building process, treasure hunters to loot the island for treasures, fisherman and more. The island can also be decorated to give it a nice appealing look. You can install cool benches, beautiful pillars, zombie statues, flowers and bushes, sidewalks and amazing pathways. Unlock all the decorations as you level up in the game and purchase them with resources that you can earn by completing the quests. These resources include tools needed to remove the trees, bushes, stones and other obstacles out of your way. Every obstacle costs a certain amount of these tools to be removed. So you will have to manage your resources and earn them by building buildings that generate them. You can also buy more resources with zombie cash which in turn, can be earned through completing quests or purchasing with real money from the game store. You can find several amazing deals in the game that will offer a great value for your money. 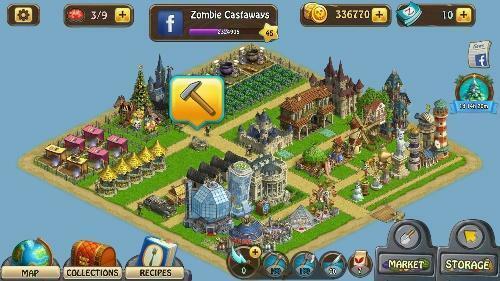 If you are looking for some really cool graphics in a zombie game, Zombie Castaways is the one for you. The game features stunning visuals with great detailing of all the buildings and the characters in the game. Cool sound effects and background music make the game play even more addicting for the players. You are guaranteed to enjoy it. Help the lost zombie find a way to zombium to become a human and reunite with the love of his life. 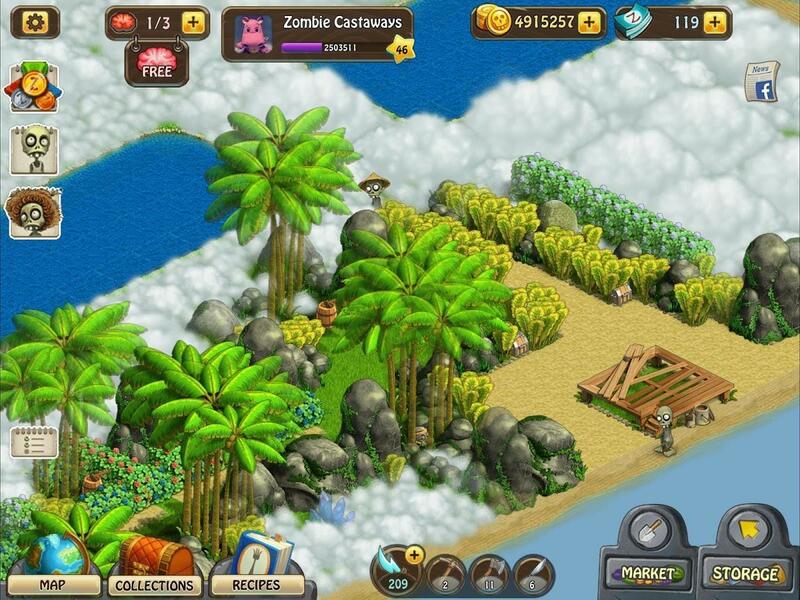 Clear the island by collecting resources and looting treasure chests along the way. Create a huge variety of buildings and decorate your island. Try out Zombie Castaways today.